The cochlear nucleus represents the beginning of several pathways with distinct functional properties within the central auditory system. By far, the majority of ascending pathways eventually terminate in the inferior colliculus (IC). 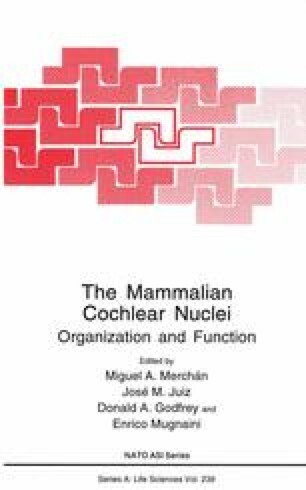 Projections to the IC originate from fusiform cells in the dorsal cochlear nucleus (DCN) and from stellate cells in the ventral cochlear nucleus (for recent reviews see Oliver and Shneiderman,’ 91; Oliver and Huerta,’ 92; Morest, et al., this volume). This direct projection may carry monaural information to the midbrain. In contrast, the pathways that synapse in the superior olivary complex (SOC) may transmit binaural information to the IC. The projections from the bushy cells of the ventral cochlear nucleus to the SOC represent the beginning of this indirect pathway (Casseday et al., this volume; Morest et al., this volume; Smith, this volume). In turn, the principal nuclei of the SOC, the medial (MSO) and lateral superior olive (LSO), each project to the IC (Oliver and Shneiderman,’ 91; Oliver and Huerta,’ 92). Both the pathways from the cochlear nucleus and the SOC terminate in the IC in a similar tonotopically organized fashion. Yet, we still know very little about how the efferent projections of the cochlear nucleus interact with other projections at the level of the auditory midbrain.